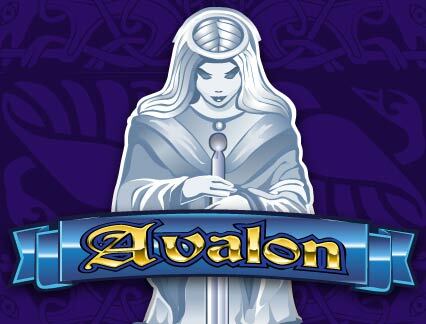 Game Information: Avalon is the original Arthurian theme-based pokie game from Microgaming launched in 2006 that will transport you through the mists of time to a forgotten kingdom filled with riches and glory! Avalon, that mythical place where the legendary King Arthur drew his strength from, promises to reveal all her secrets to you. Avalon is one of the most successful and popular of all Microgaming themed pokies and it features free spins and plenty of game winning special features. The game offers 5 reels and 20 pay lines with a medium to medium-low volatility which means this is not the best Microgaming title to pick if you’re looking for that massive payday. In Avalon, the scatter symbol is represented by the Lady of the Lake, the mythical figure who, according to the original legend, returned Excalibur to the land. In the game however, the Lady of the Lake gives you free spins, if you’re lucky enough to land three or more of her across the 5 reels at the same time. The number of Lady of the Lake scatter symbols that you manage to get will also determine the strength of the multiplier included in the free spins round. You can get the basic 2x multiplier all the way up to a 7x multiplier. You can also retrigger the free spins round during the bonus game, all adding to a potentially huge windfall. The Lady of the Lake not only offer free spins in a bonus round, she also includes the strength and potency of the multiplier. The multiplier transforms your winning totals by multiplying them between 2 and 7 times their value! This can really add up, especially if you manage to retrigger the free spins rounds, which add more chances for total boosting multipliers. The treasure chest represents the games wild symbol during the bonus round and effectively doubles your winnings. The games other wild symbol is the Avalon Castle and this symbol can appear anywhere during the game, and at any time. The Avalon Castle wild also doubles your winning totals. While the graphics may be a bit dated when compared to some of the newer titles by Microgaming as well as other software providers, they are nevertheless still very engaging and enthralling. The game is filled with a medieval style, with plenty of mystery and romance, accompanied by an equally charming and myth-inspired soundtrack. The game also looks good on both mobile phone and tablet devices. 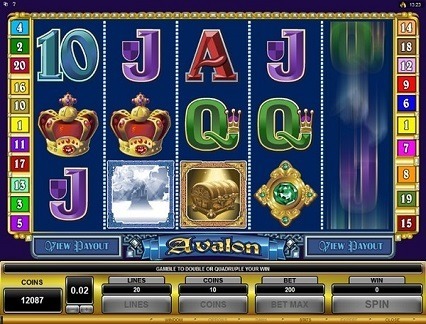 While Avalon is not a Microgaming progressive jackpot pokie machine it does offer a fairly decent maximum payout of 3,000 coins (at a max bet of 200 coins) or, if you happen to hit the jackpot during a free spins bonus round, and with a 7x multiplier, you can push this max jackpot up to 21,000 coins, quite respectable in most circles! More good news is that this game offers a payout rate of 97% and is considered to be a medium low to medium volatility jackpot game. This essentially means that the game payout fairly often but in smaller amounts, a characteristic which actually suits some players perfectly. Moreover, hitting the bonus round multiplier at an average of 4x multiplier or more is actually quite easy to do and happens frequently enough to make this games bonus round something to look forward to. 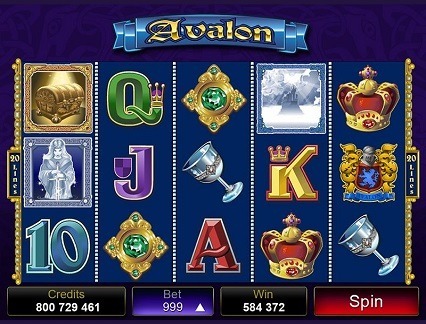 Avalon offers plenty of game winning action with easy to get scatters that trigger a fantastic bonus round that can prove to be very lucrative indeed. Free sins can be retriggered and the accompanying multiplier really helps to push totals up considerably. Another cool additional special feature is Microgaming’s Gamble Feature. Gamble Feature: Microgaming’s Gamble special feature will appeal to daredevils as well as players that like a little more edge to their slots gaming. The gamble feature offers those that choose it, the opportunity to double or even quadruple their winnings. The gamble feature is available after a win in base play or after a free spins round. Players are presented with a face down playing card and if they can correctly guess the colour (red or black) they can double their winnings. Guessing the correct suit will quadruple your winnings but be warned, getting it wrong will cost you your winnings!